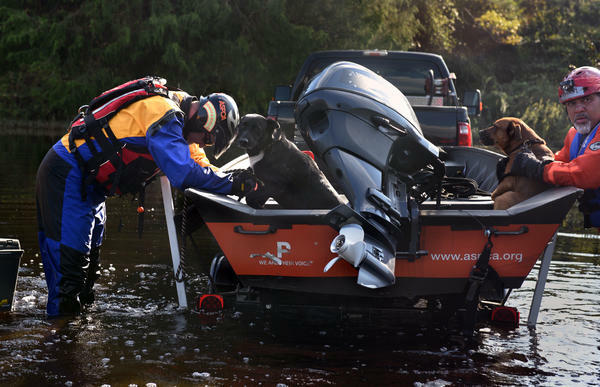 The ASPCA has a number of tips for how to keep pets safe during a storm. On the top of the list: Don't leave them behind. "For me, this is what the work is all about — the ability to provide help to helpless victims in such a devastating situation," Leath says. 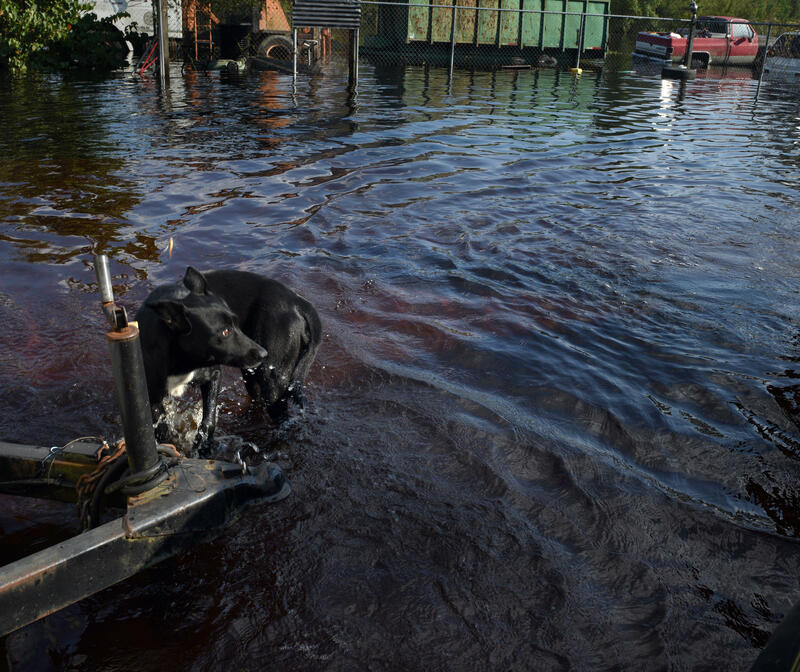 A dog awaits rescue from Florence's floodwaters. The flooding hit Maxton, N.C., rapidly, the Asheville Citizen-Times reported, when temporary levees failed. 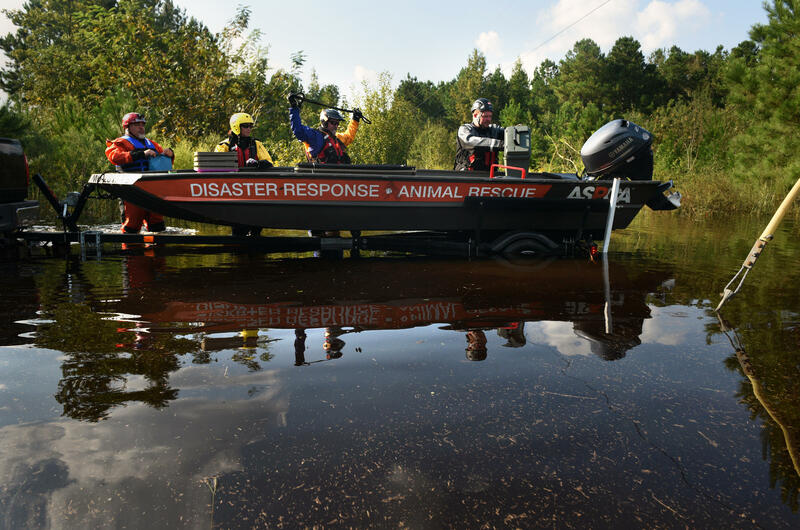 An ASPCA team — including (from left) Manny Maciel from New Bedford, Mass., Jasmine Holsinger from Myrtle Beach, S.C., Kyle Held from Jackson, Mo., and Adam Leath from Fort Myers, Fla. — used a water rescue boat to bring animals to safety. 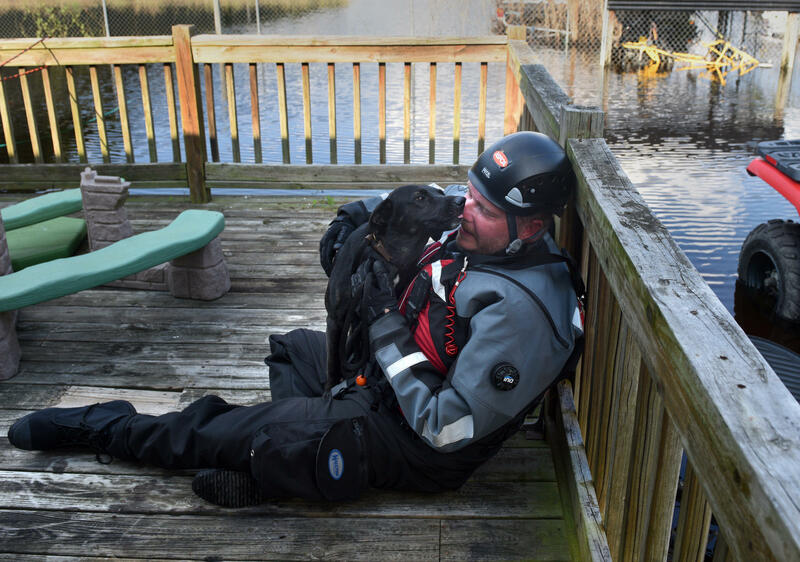 Held carries a nervous dog rescued from floodwaters in North Carolina's Lumberton area. Held is exhausted after a long day of rescues in sweltering heat. On right is his colleague Manny Maciel. 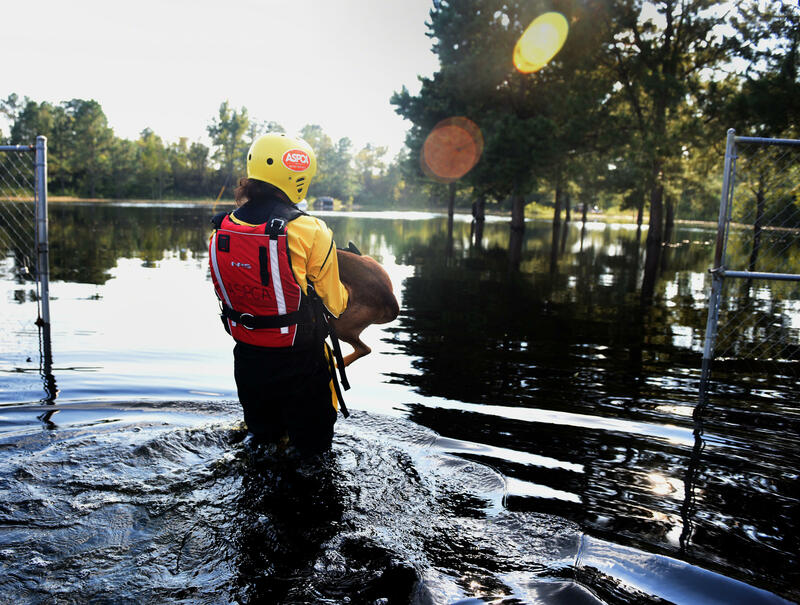 Some families were unable — or unwilling — to take their pets with them when they evacuated. A resident cut a hole in the fence of his neighbor's submerged kennel to let the dog out for rescue. Held calms another nervous dog in need of assistance. 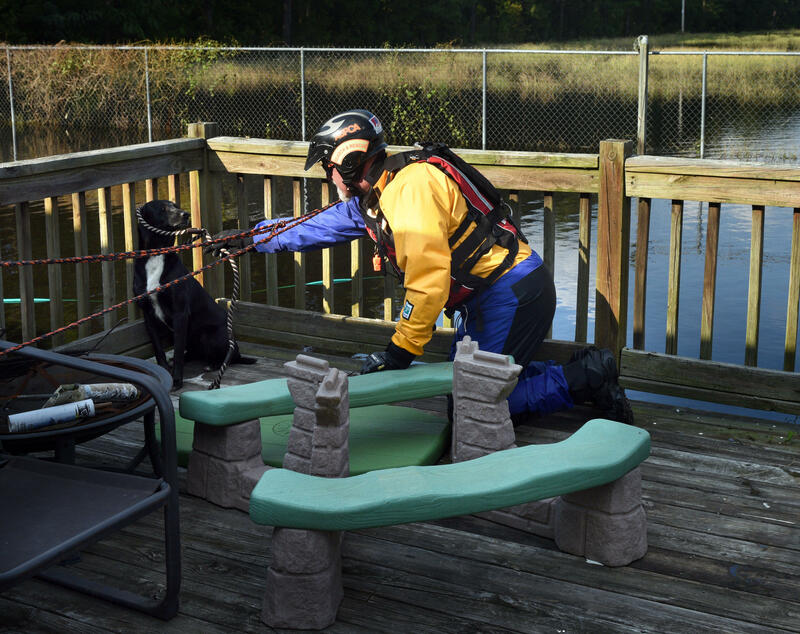 Leath has become known among fellow rescuers as the "dog whisperer" because of his skill at comforting frightened canines. 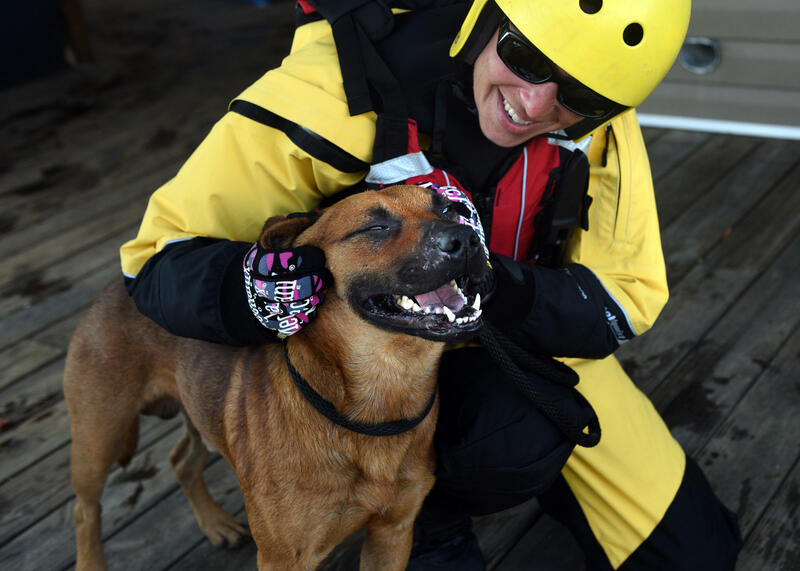 One saved dog was happy to be safe and sound and getting its ears scratched by rescuer Jasmine Holsinger. Holsinger carries a dog to safety. 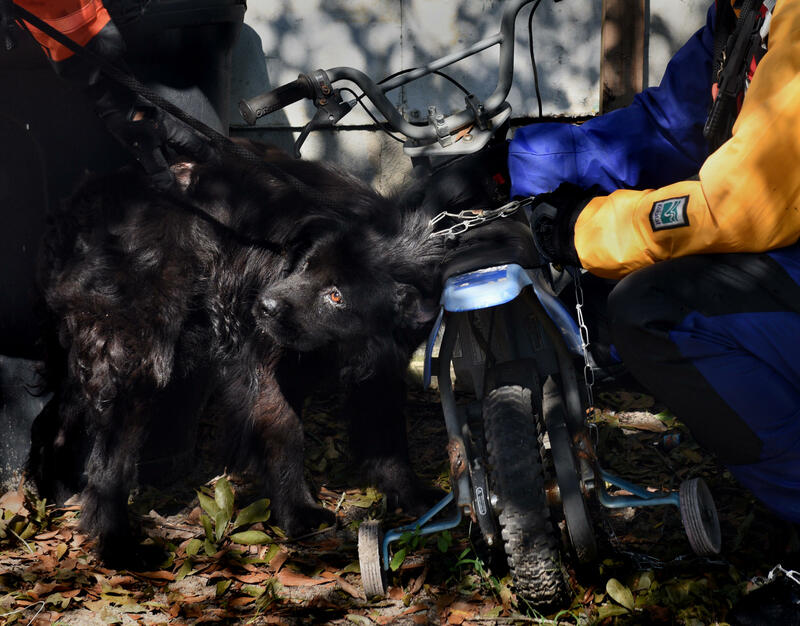 The rescued animals are brought to a shelter. Maciel (left) and Holsinger and the rest of the team have been directed to dogs in need by concerned neighbors or owners who have evacuated. It wasn't immediately clear whom the dogs rescued from the porch belonged to. Placards are left at rescue sites so owners have a chance of reuniting with their furry friends. 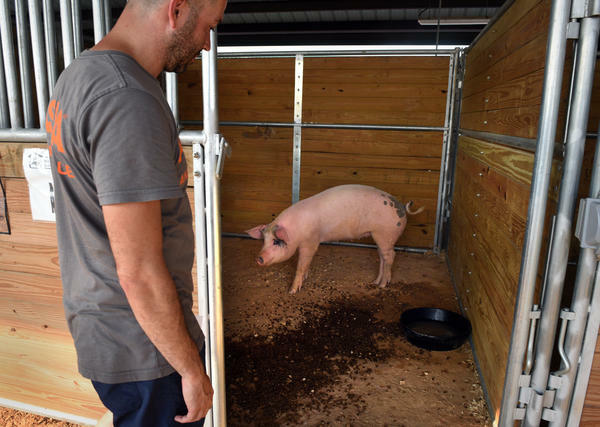 Some of the animals rescued by the ASPCA are kept at a staging area at a fairgrounds in Lumberton, N.C.
A pig was rescued swimming in floodwaters. 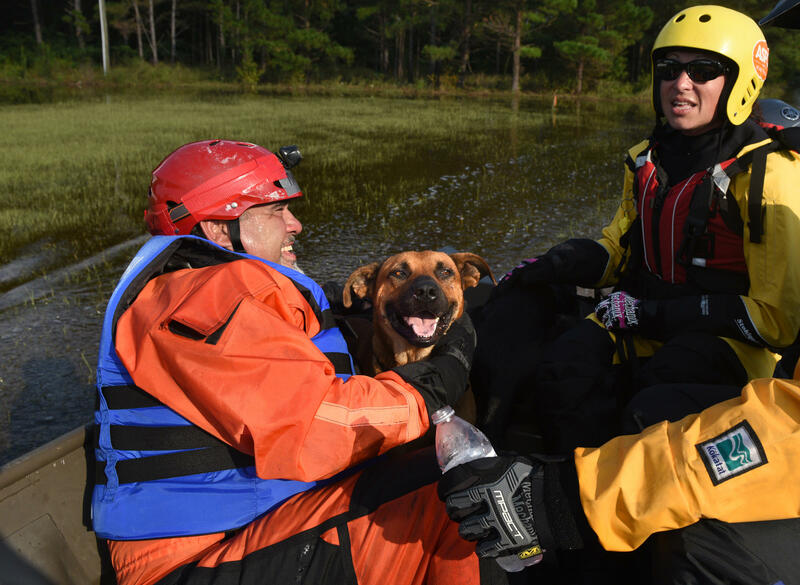 It's not just dogs and cats that need rescuing from the floodwaters caused by Florence. 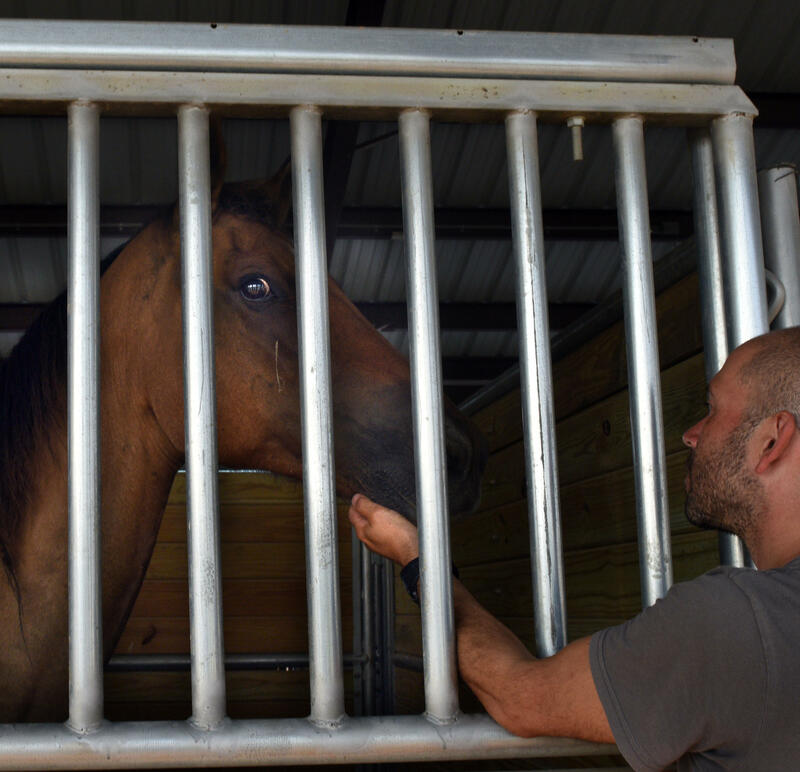 A rescued horse is cared for at a staging area in Lumberton. On a recent afternoon, photographer Carol Guzy set out with rescuers from the American Society for the Prevention of Cruelty to Animals. They were searching for animals in trouble in the flooded area of Maxton, near Lumberton. "It's a magnificent feeling to be able to be in a position to help a community recover," ASPCA rescuer Adam Leath told Guzy. Leath has become known among fellow rescuers as the "dog whisperer" because of his skill at comforting frightened canines. 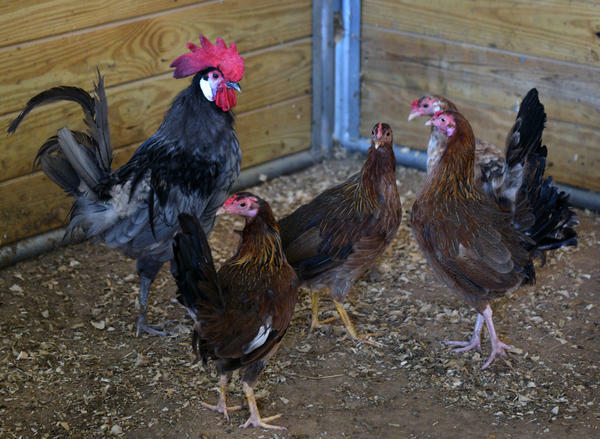 It's not just dogs and cats that need help – in recent days, teams have rescued a number of different species, such as pigs, chickens, horses and even a peacock. 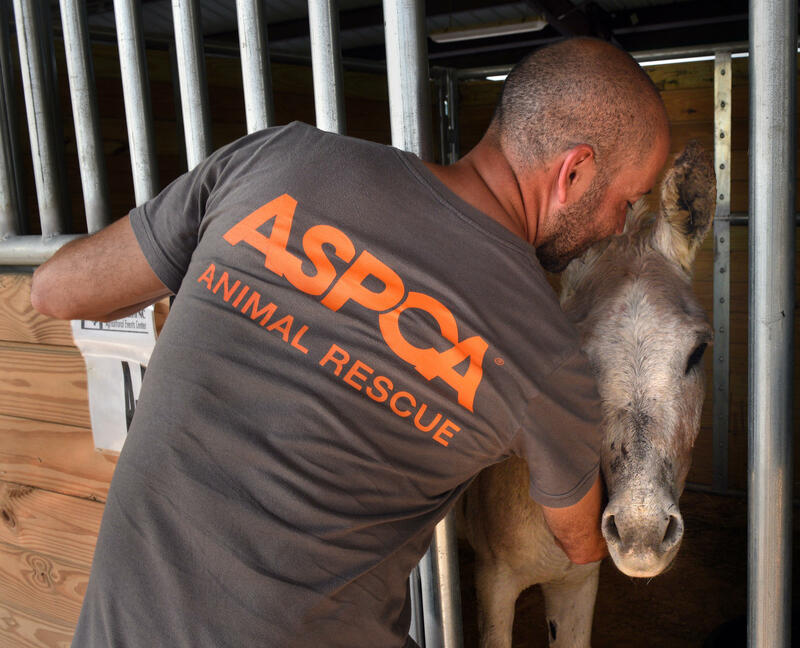 According to the ASPCA, at least 550 animals have been assisted in the days after Hurricane Florence. On this day, Leath and the other rescuers save several dogs in dangerous positions. 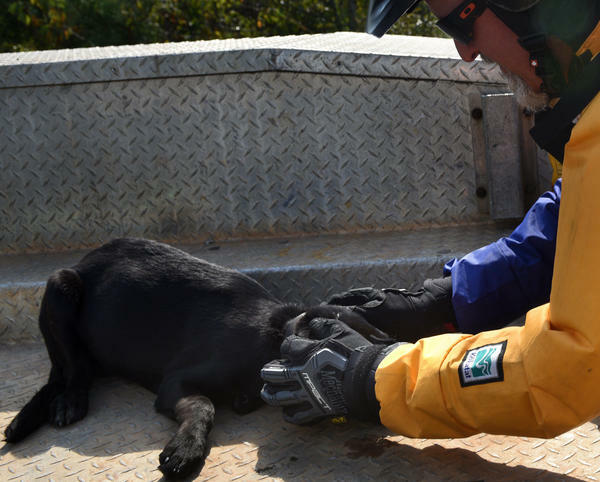 During one rescue, the organization was contacted by the neighbor of a dog owner who had evacuated. 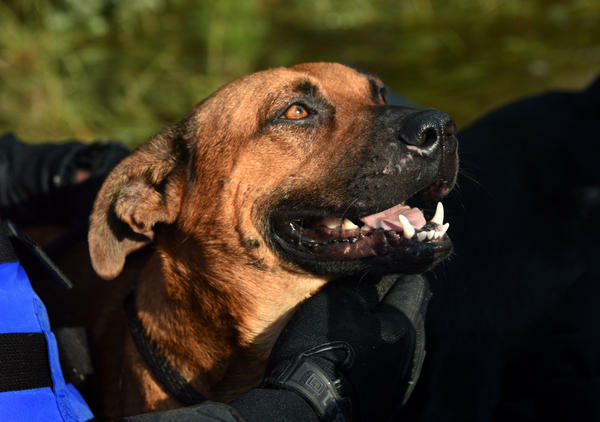 "The dog was chained inside of a pen and the rising floodwater certainly made for a very hazardous environment for that dog," Leath said. He said the neighbor had cut the fence open and asked the rescuers to shelter the animal and search for the dog's owner. Every animal they rescue, Leath said, is brought to a shelter. They also "place placards on each of the doors where we retrieve animals from, so that whomever might be returning has a great chance of being able to be reunited with their lost pets," he said. In another rescue, Leath said they received a call from a resident who reported three dogs that were trying to stay dry on an evacuated neighbor's porch. "It was the only dry place," he said. "They had numerous feet of water. ... As we were walking up, you could see just how frightened these dogs were." 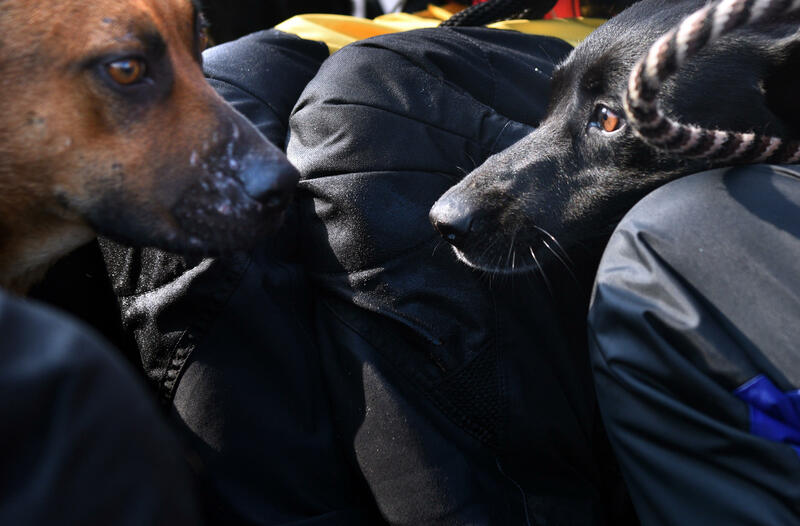 Leath said that in some cases, pet owners who left animals behind will ask the rescuers to simply look in on the animals to ensure they are still safe. "For me, this is what the work is all about — the ability to provide help to helpless victims in such a devastating situation, which also helps for the recovery for a community and the recovery for each individual family," he said. Shelters across the area impacted by Florence are overwhelmed by animals. 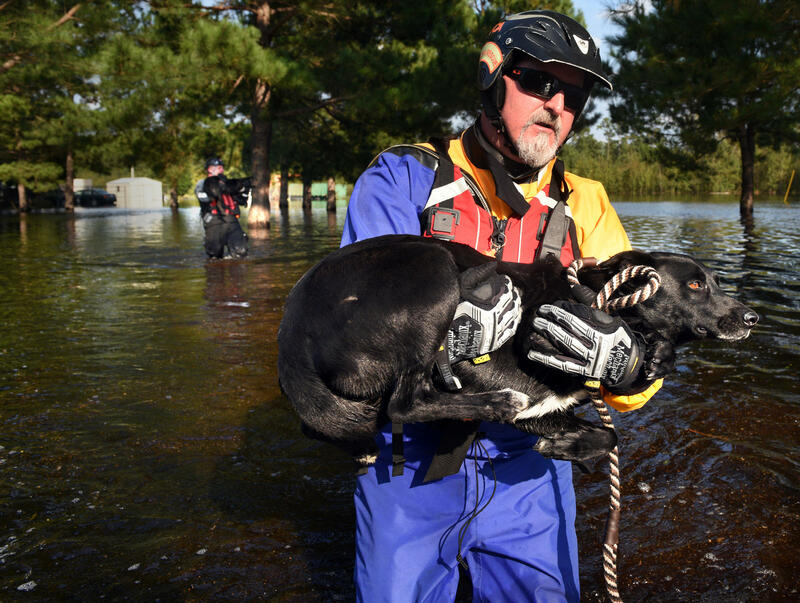 NPR's Brian Mann visited a shelter in Wilmington, N.C., housing more than 100 dogs and dozens of cats. "We have a lot of animals here and we keep getting them," Nancy Ryan, who works at the shelter, told Mann. "People left them pre-storm when they were leaving town, and of course, they can't really get back to town to get them, so they're still here. And now we have some coming after, people that had abandoned their animals in flooded yards." Other shelters were forced to evacuate all their animals, Elaine Smith of Cumberland County Animal Control told Mann. 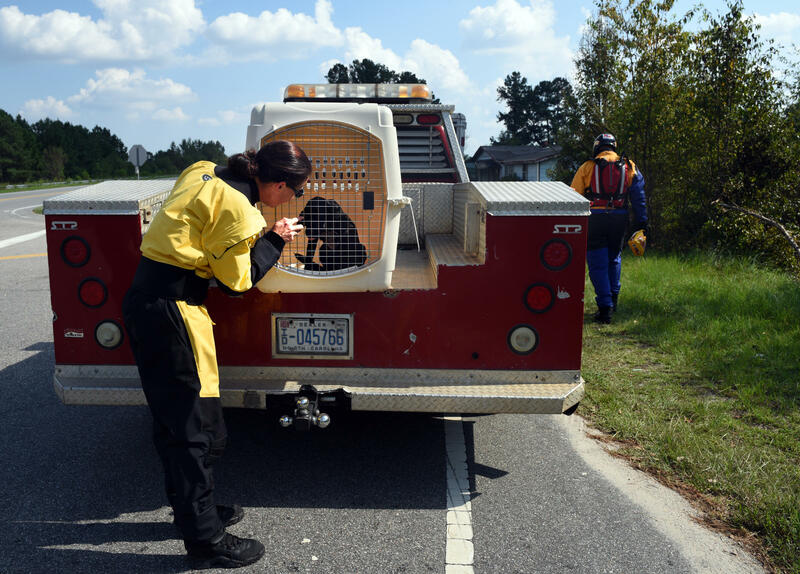 "When you have 225 animals to evacuate, you cannot wait," she said. "We were very brisk about it, but it took us two hours to get all the animals loaded and out of the building." It's worth noting that one person has found themselves in legal trouble after assisting animals belonging to storm evacuees. As USA Today reported, Wayne County resident Tammie Hedges was arrested after caring for 17 cats and 10 dogs. The newspaper states that she was working on converting a warehouse into a shelter, but "her facility was not legally registered as a shelter." The ASPCA has a number of tips for how to keep pets safe during a storm. Chief among them: Never leave pets behind. And in particular, never tie animals to poles or trees, because they would not be able to escape to higher ground if floodwaters rush in. The organization also recommends that pets wear ID tags and have an implanted microchip.